Going out for dinner is the easiest way we know to tame the “What’s for Dinner” battle cry! A night out at a restaurant can be a big treat for everyone in the family, especially if it’s a new experience for your smaller children. We’ve heard many stories from families (the good, the bad and the ugly), about their restaurant experiences. First, identify family-friendly restaurants in your area — does it have a children’s menu, high chairs, booster seats, and children’s activities available? What’s the noise level like? Is it easy to navigate through the tables to get to the bathroom? What’s the target demographic for the restaurant? 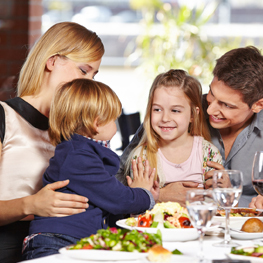 Before you even step out of the car, outline your expectations to your children about good restaurant behavior. Keep them simple. The use of inside voices, the importance of staying seated at the table (no running through the restaurant,) and good manners are three great rules to start. Don’t hesitate to cut your dinner short and leave if your children don’t behave. It’s a shame to waste an evening out, but most restaurants are able to quickly pack up your leftovers so you can make a rapid exit. In our experience (depending on your children’s ages) you only need to leave halfway through dinner once and kids learn that you are serious about these expectations. Breakfast and lunch are an ideal time to introduce your children to restaurants and teach them the rules. With lower prices, and faster service, it’s often easier to enjoy a successful outing. If you want to try eating dinner somewhere a little more upscale, consider going right when the restaurant opens for the evening (4 or 5pm, usually) to reduce the stress of long lines, noisy dining rooms and slow service. Food courts and buffets offer a large selection of food, making them excellent choices for picky eaters without the formality of table service. If your kids get tired of chicken nuggets off the kids menu and want to try what you’re having, either split a larger portion or consider ordering off the appetizer menu. It’s a great opportunity to let them experience new flavors without committing to a jumbo entree. Hungry children are not patient. Plan to go to the restaurant half an hour your child’s regular dinner time to reduce fussing. Bring some crackers or cereal along in a small baggie just in case the wait becomes too much to bear. If your child isn’t drinking from a regular cup yet, don’t forget to bring their sippy cup; wait staff are usually more than happy to refill it with water if you ask. When you arrive, order the children’s food immediately even if you’re not ready yet to order yours yet. If the restaurant is busy, this will ensure yours child’s order gets in early. They’ll have lots of time to linger over dessert while you finish your main course. Take along a coloring book, a small quiet toy to play with or a book to read at the table. Some inventive parents we know pack a special restaurant bag with toys and treats that only comes out at the restaurant. Keep your children entertained with simple games, like ‘I Spy’ or tic-tac-toe with the sugar packets. Our children even polished up on math skills by learning to add creamers and sugar packets. A trip to the bathroom can be a good distracting technique for a restless child. Try going after you order and before the food arrives — it might save a trip in the middle of the meal. We always pack a washcloth or pre-packaged wipes to help cleanup during or after the meal; nobody wants to be the parent who leaves a disaster area behind. While messes happen, don’t forget to tip generously if cleanup will be more than usual and do what you can to demonstrate good social behavior to your kids by tidying up after yourselves a little on your way out. With a little pre-planning, eating out with the kids can be a great way to expand their palates and teach them pro-social behavior in public. Bon appetit! This entry was posted in Uncategorized on March 30, 2017 by Calgary's Child. Are you tired? Me too! But, guess what… your child or teen is probably even more tired. In fact, 80 per cent of teens, and nearly 70 per cent of kids under 10 are sleep-deprived. Sleep deprivation can be a significant problem for kids, interfering with almost every aspect of their lives. Tiredness can make it difficult to learn and retain information in the classroom, cause distractibility and difficulties with attention, (it can be mistaken for ADHD) and may even result in a child falling asleep in school or while doing homework. Sleep deprivation may reduce a child’s motivation to participate in activities or cause kids to become cranky, impatient and badly behaved in social situations. The sleep stealer: No time to sleep! Many kids and teens have schedules so busy that they simply can’t get to bed early enough to get at least eight hours of sleep. The sleep solution: Cut down on extracurricular activities. This is the answer if your child doesn’t have time to do homework, eat, bathe and relax for 30 minutes before bed. The sleep stealer: Too much screen time! When viewed right before bed, the TV, computer, cell phone or other electronic screens can interfere with your child’s ability to relax and dial back brain activity in preparation for sleep. In addition, too much screen time during the day wastes time, making it difficult for your child to complete all tasks and activities before bed. The sleep solution: Turn off the screens. All ‘screens’ should be turned off at least 30 to 45 minutes before bedtime. Resist the urge to allow a TV in your child’s bedroom and ensure that, at night, the cell phone is also docked in another room. If your child can’t ‘resist’ the computer or handheld games, be sure to have strict, enforced rules to limit their use. The sleep stealer: Wrecked routines! When your child’s bedtime is different each night, chaotic, loud or stressful, it is much more likely to result in difficulty falling and staying asleep. 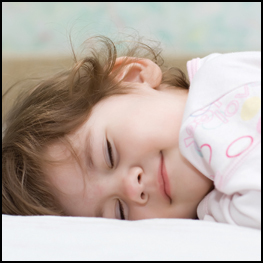 In addition, without a routine, your child is much less likely to get the recommended number of hours of shut-eye. The sleep solution: Kids are much more likely to get enough sleep when they have a predictable, soothing bedtime routine. Start at the same time every night, and include bathroom activities, reading or a quiet game and then end with a short hug and kiss. Don’t get into bed with your child. Instead, teach them how to ‘self-soothe’ by encouraging them to fall asleep on their own – without your help. The sleep stealer: As with adults, snoring can cause chronic sleep deprivation for kids because they never get a good night’s sleep, even if they seem to be getting enough hours of sleep. Some reasons that kids snore include enlarged tonsils or adenoids, being overweight, allergies and sleep apnea. The sleep solution: Although it may seem minor, snoring is a sign that something is not quite right with your child’s health. When your child snores routinely (not just when they have a cold), it’s important to talk to their health professional about what may be causing it. Don’t quit searching for the answer until you find it! Your child may not know it now, but they will thank you later. Dr. Susan Bartell is America’s #1 Family Psychologist. Her latest parenting book is The Top 50 Questions Kids Ask. You can learn more about her at www.drsusanbartell.com. This entry was posted in Uncategorized on March 9, 2017 by Calgary's Child.